The winter continues. This week, if this were any other winter, you’d be in for a great run through the wooded paths of Breakheart. Instead, I’m making up an 18 mile route that actually has roads you can run on. That’s easier said than done. The current plan (Here’s the map) is to run Swains Pond to Spot Pond to Farm St for 18.5 miles. Swains Pond is new for this years group and it can be a little confusing. We cross Main St right away and head up East Foster to Melrose Common. Turning right at the Common Market at 6th Street we’ll head straight onto Swain’s Pond Ave. This will wind its way around Swain’s and Turners Pond through a very pretty part of Melrose. Note there are some blind turns in the road so run cautiously. Also, at the ponds there is an intersection where you won’t know where to go. Swains Pond Ave turns right. Don’t go left, don’t go straight (there’s a big hill there you won’t want to go up so don’t), go right. If you did it right the pond will be on your right as you continue on. After doing that right you’ll pop out to Lebanon St. There will be a little market on the corner. Turn right here. If you aren’t paying attention you’ll head left thinking you didn’t have a decision to make here, then you’ll end up and Malden and we’ll never find you so go right on Lebanon. On Lebanon you’ll hit an intersection with a set of lights, an auto mechanic garage, a school. This is Forest St. Turn left here and run past Oak Grove. This will take you to Main St where we’ll have the first water stop set up. That all sounds really confusing, pay attention and you’ll be fine. We’ll be back here in a few weeks so do it right this time and it will be much easier next time. From here you’ll head out Winter St over the Oak Grove T Stop to a 5 way intersection. Your options there will be a sharp right, a soft right, a straight, and a left. Go straight onto Glenwood St. This windy hilly road will bring you to the rotary where the paperboy sits at the Fellsway East and Highland Ave. Go through the rotary onto Highland Ave. Now you know where you are! Follow Highland up to Mobil Station, go left onto Elm, Right onto Main St/Rt 28. Follow that to the parking lot at Straw Point (if you get to Friendly’s you went a little too far). We’ll have a water stop at Straw Point. Now continue on past the Zoo and down Pond St to Grimsby’s. Turn and follow the Lynnfells Parkway past the Middle School. We’ll have another water stop at the knoll across from the middle school. Next up, take the Fellsway out to Main St in Saugus. Turn left at that intersection where there used to be a gas station and there used to be a J Pace’s. Follow Main St, it’ll turn into Farm St and take you to Wakefield High School where we’ll have another water stop. From there you run out to Water St, take a left there and follow it to Main St in Wakefield Center and follow that on home to Melrose and Brueggers. Besides the first part this route is a bunch of pieces of runs you’ve already done so you should be fine after we get started. If you’re running short you’ll do the first part and continue on out Highland. At the end of Highland you’ll head along the front side of Spot Pond like you’ve done several times before and down Pond to Grimsby’s. There you’ll have a choice to go back Wyoming for 7.5 miles or turn left along the LynnFells to Main St for an extra mile. If you’re interested in a distance more like 10 miles, run the longer route but go straight at Grimsby’s down Wyoming. So who’s in for this impromptu, flying by the seat of our pants route? ROLL CALL!!! Week 7 – Sidewalks are back! Last week we had 41 stars running through Melrose, Stoneham, and Winchester… and that doesn’t include our two dogs. That’s a record for the Sunday Long Run group. Thanks to all of you for making this program such a success! At the end of this week’s run you’ll have completed half of the training to get you to Boston. You’ll also have completed the first week of the season in which sidewalks will be clear along the route. The weather usually plays a role in our training seasons but this year it has taken center stage in an attempt to steal the show. Temperatures in the 50s, a little rain, and some sunshine has cleared the 14 mile path this week, although as if not to spoil you the temperatures have quickly dropped and you’ll be greeted by wind chills near 0 degrees on Sunday morning. But enough about the weather! We know the real stars are the runners braving whatever is thrown in front of them to get their training miles in. This Sunday we’ll be running familiar roads in an unfamiliar way. If you’re running the full route, pay attention on the way out because you’ll be coming back the same way. We’ll head out to Franklin St just like last week except we’ll take it all the way up to Stoneham Center and turn right left on Main St. Be careful on this road, although its wide it can get busy and cars travel fast. This will take you over to Spot Pond where I’ll be waiting at Friendly’s with a water stop. If you’re running the shorter route you’ll turn here and head past the Stone Zoo, go left down Pond St, and another left at Grimsby’s onto the LynnFells Parkway. You know what to do from there, you’ve done it a few times already in this training: LynnFells to Melrose St to Main and Brueggers. For those running long you continue straight. This will bring you around the back side of Spot Pond, through a few hills to Elm St and up a long hill to the rotary at Highland Ave. Head out Highland this week, that’s off to the right after the Mobil Station onto Highland. Highland Ave towards Malden. A right there at the rotary. Got it? I’ll be doing a water stop at the end of Highland Ave near the rotary on the Fellsway East end. After that water stop you’ll be running up the Fellsway Easy, through those awesomely fun hills, and over to Grimsby’s. And at that point, just in case you think to yourself “I could use one more awesomely fun hill right now”, turn left and work that Pond St hill back up to Spot Pond. The sidewalk is clear there, but it might be icy, be careful and be smart here. At the top of the hill go right out past the Stone Zoo, take a peek and see if the wolves are out at the zoo and then head over to Friendly’s for the third and final water stop of the day. From here you go back the way you came, Main St to Stoneham Center, right on Franklin St back to Melrose, and right on Main St to Brueggers. Want more than 7 but less than 14 miles? Head out with the longer runners but turn right at Grimsby’s down Wyoming for a 10 mile run. For 11 miles go straight at Grimsby’s and finish up like the shorter route goes. Be familiar with the route. Ask at the water stops if you aren’t sure where to go next. If the stop is unattended, there will be a map in the car for reference. Speaking of water stops, I’m still on the bench so I’ll take care of the first and second stops, then there will be a car left back at Friendly’s for those that get there before I make it back. Who’s in for the cold, sunny, sidewalking run? ROLL CALL! Here we go into Week 6 of the Wintriest Winter Ever! Well since the Ice Age anyway. But even though Old Man Winter is trying to keep us down, the SLR group is on the verge of its first 40+ runner week. I’m thinking as soon as we get a nice week we’ll break that mark. This week you’ll go on my favorite run of the whole season. Starting from Brueggers you’ll head up to Spot Pond and go right. That will take you past Friendlies and over towards I-93. Don’t get on the highway! Although the breakdown lane is probably cleared wider than the roads we’ll be running on, I think there’s laws against running on the highway. Instead go to the next set of lights and turn right. This will take you up and over I-93 to the first water stop. After leaving the stop you’ll head down Forest St into Winchester. Enjoy the wideÂ wooded downhill because you won’t enjoy the same stretch a little later. Taking a left on Highland Ave, climb up to Winchester Hospital and take a left onto Reservoir, what I consider the nicest street of the long run program. Take in the scenic Winchester Reservoir, the woods of the Fells, the large beautiful houses, the gas light style street lamps, and ignore the giant hill in front of you. Reservoir Rd will loop you back to Highland Ave. Take a left onto Highland and follow it all the way to the end for another water stop. Oh yeah, and Highland is named Highland because it ends up in some high lands, so yes there are hills. Love them, they’ll love you back. At the water stop ask where you’re going next. We’ll try to explain it to you. You’ll take a right onto Rt38 and head over to a rotary. The goal is to come out of the rotart on Main St in Winchester. One trick though, there’s no street sign for Main St. Going counterclockwise in the rotary (with traffic) it will be the second street, the first being a small road, Main St being a bigger road. This will take over to a 5-way intersection crossing the Mystic Valley Parkway. Cross and bear right onto Washington St (look at the map before hand and make sure you understand this). Now it gets easier, follow Washington St back to Forest, turning right at the intersection with the Gingerbread Construction Company. Run conservatively up the hill, as Forest St is a progression of three hills on top of each other that go on for about a mile. This hill is getting you ready for any hill that’s ever put in front of you. Don’t let the hill beat you, you beat this hill, because there’s candy at the top of the hill! You’ll find yourself out of breath but back at water stop 1 at the top. Now things get familiar again. Leaving the water stop head back over to Spot Pond the way we came, taking a right on Park St. At Friendly’s take a right and run the backside of Spot Pond. Turn at Elm and head up to the Flynn Skating rink. We’ll have a little stop there before you head home to Melrose via Pond St and West Wyoming. Sounds like a long run, we’re just getting started on the longs one now. Two more months til Boston! For those running shorter, you’ll be following the same route but taking a short cut in the middle. 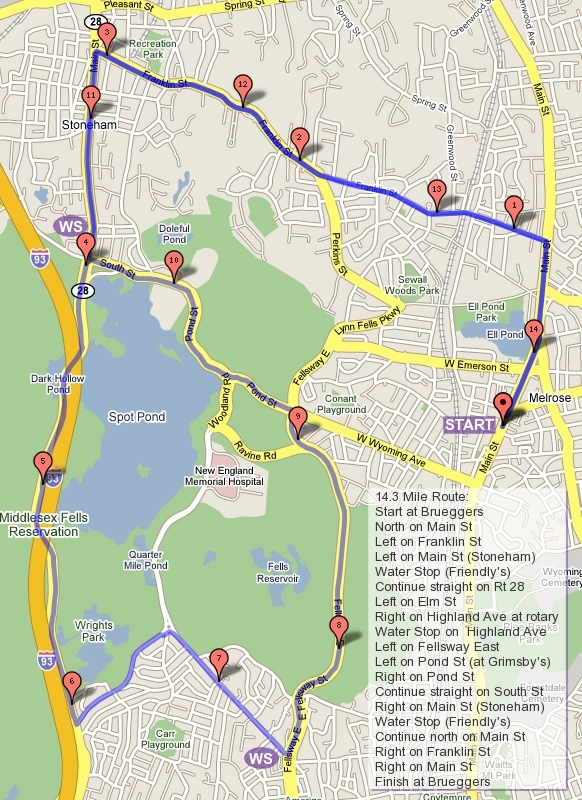 For those not interested in the full route, there are a few short cuts listed on the map to help you tailor your run. For those running Boston, don’t look at the short cuts. As for water stops, Barry will be away but I’ll be handling the stops along with my two lovely assistants, Mary and Sue Clough. Ok, who’s ready for Week 6? ROLL CALL!!! Last week we had 38 runners and two dogs navigate there way through the snowy streets of Melrose, Malden, MedfordÂ and Stoneham to run anywhere between 7 and 15 miles. At that point I thought this group was training through some of the more challenging snow conditions we’ve ever seen, but I did mention that in a way we were lucky, we haven’t had to run through a storm yet. Since then we’ve received yet another of our seemingly weekly snow storms, this one adding a bit of sleet and rain to really spice things up. This has left snowy roads, icy corners, and even larger snow banks along our favorite running routes. Now for the icing on the cake, Saturday will be providing us with a rain/snow mix, most likely more rain than snow in Melrose. This should lead to some icy conditions for us in the morning, or possibly puddles with small icebergs floating around in them. The good news, there has to be some good news, is that temperatures will be above freezing for most of your run. When was the last time that happened? Sunday’s run would have been a nice romp through Breakheart, which is beautiful in the winter time. You won’t be seeing that tomorrow unless you bring your snowshoes. Instead we’ll be following the snow route. Yes, there is a snow route already designed for conditions like this, scroll down under the Breakheart map and find the Pine Banks alternative. In this snow alternate we run Farm Street, like we did in WeekÂ 0 and tack on a loop of Pine Banks at the end. A water stop will be provided near Brueggers for those continuing on. The shorter route runners will follow their regular route unless the would like to stretch the run to 8.8 miles, running the Farm Street route with the longer runners. While this season has been challenging, the training continues and is forming a very hardy breed or marathoners and half marathoners. I promise you, in a month or so the roads will be clear, the warm sun will shine on you, and spring will let you know its coming. In the meantime WHO’S IN!!!! Roll Call! Who will we find at Brueggers at 8AM? Please post so our Gatorade and Water purchases are adequate.